2018 presents an historic opportunity to restore and enhance the Arroyo Seco River. Now that the U.S. Army Corps of Engineers has adopted an ambitious $1-billion proposal to restore 11 miles the Los Angeles River, attention is turning to the Arroyo Seco and its future. The Arroyo Seco Confluence with the Los Angeles River is included in the Army Corps' LA River Study, but the Corps has also been conducting a similar plan for the Arroyo Seco extending up to the San Gabriel Mountains. The Corps' Arroyo Seco Watershed Ecosystem Restoration Feasibility Study provides an enormous opportunity for massive river restoration throughout the urban portion of the Arroyo watershed. In response to the Corps' desire for community involvement, the Arroyo Seco Foundation has developed a guiding vision for this restoration — the Arroyo River Parks Program. The goal of the Arroyo River Parks Program is to link existing parks and open spaces to each other and to the river. 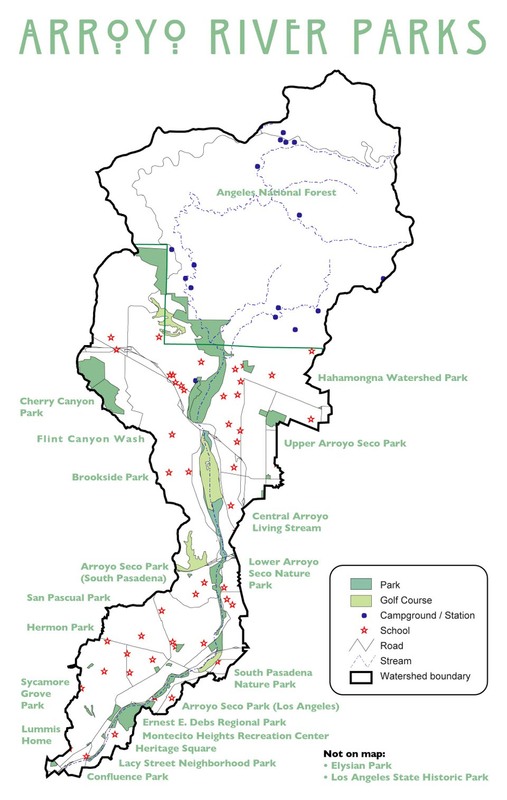 Rather than focusing on a few key sites along the 11-mile urbanized stream course, Arroyo River Parks is an approach that will integrate the more than 30 parks and open space linkages that line the concretized stream as part of a cohesive network supporting hydrological, ecological, and social connections — and emphasizing respect for place. Rather than just being parks that overlook a river, these parks and open spaces will be reconfigured as part of the river system. We look forward to your involvement and support as we pursue this exciting opportunity for the restoration of the Arroyo Seco watershed.